Some people for a variety of reasons choose to do all their training at home. Others prefer to train in a regular gym, but find themselves stuck without access to a full training facility from time to time. While I'm a huge fan of barbells, a fantastic, cost-effective, space-efficient option for home training is a set of adjustable dumbbells (note: I would still encourage the purchase of a barbell set if at all possible). 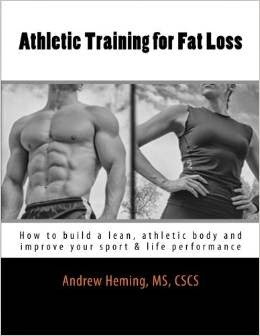 To help maximize your home-training results, here is a complete sample athletic-based training program that you can do in the privacy and convenience of your own home with a pair of adjustable dumbbells. Warning: this is a sample program and may not be appropriate for you. Adapt as needed. Consult your physician before starting this or any exercise program. Those with injuries, medical conditions or movement dysfunctions will likely need this program modified for their individual needs. Having a pair of PowerBlocks or a similar product allows for faster weight changes. This program was designed for those with your basic adjustable dumbbells so that you did not have to change weights within the same exercise pairing. 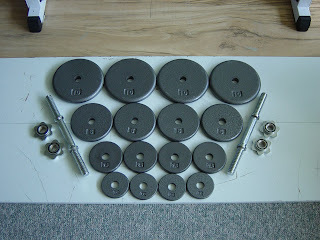 Trying to gain muscle: use higher range of sets and reps, minimal to no conditioning at the end and eat big! Start with a dynamic warm-up. I have several examples and ideas on my YouTube Channel for you to choose from. 3b) 1-Arm DB Row (elbow in with supination): 2-4x8-10, rest 10-20 sec between arms and between presses. If you have a chin-up bar, you can replace this with neutral grip pull-ups, pull-ups or chin-ups. Jump Rope Skipping: 10 min total time. Do 20-30 sec on, 20-30 sec off or just try to do as many skips as you can in 30 seconds.